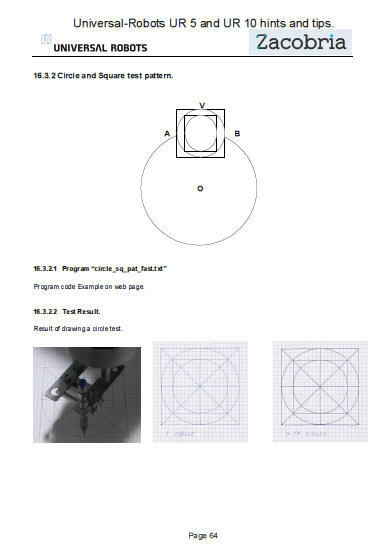 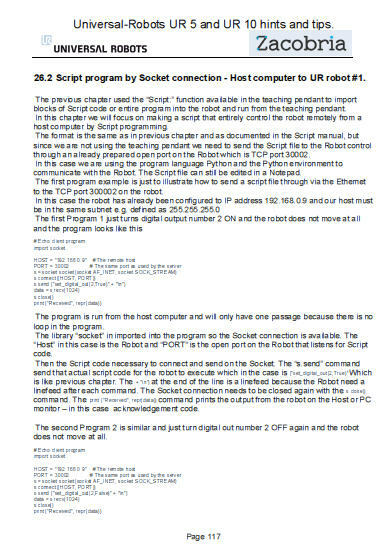 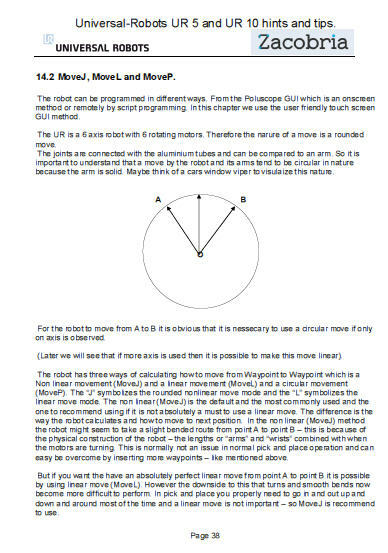 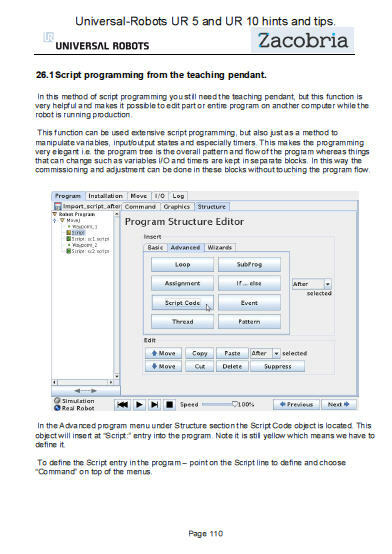 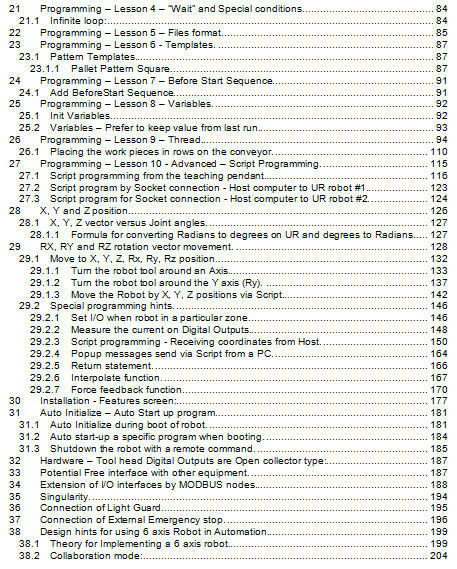 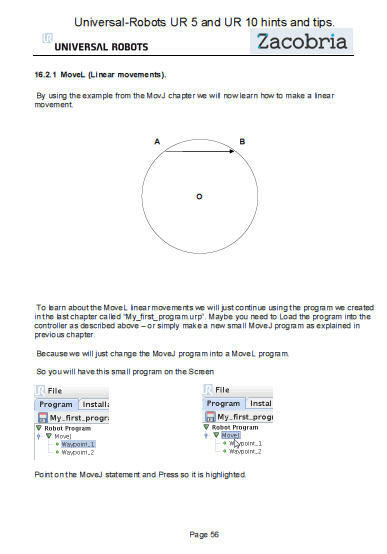 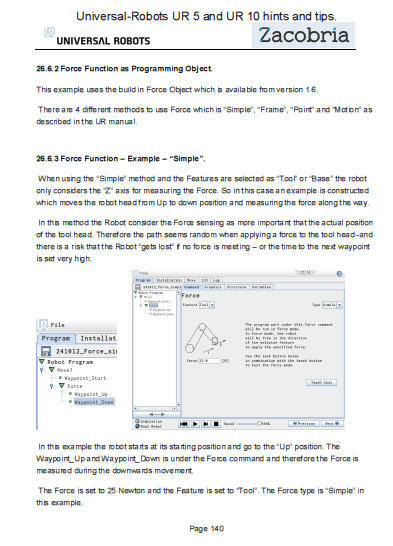 Programming the Universal-Robot UR 5 and UR10 industrial robot hints and tips. 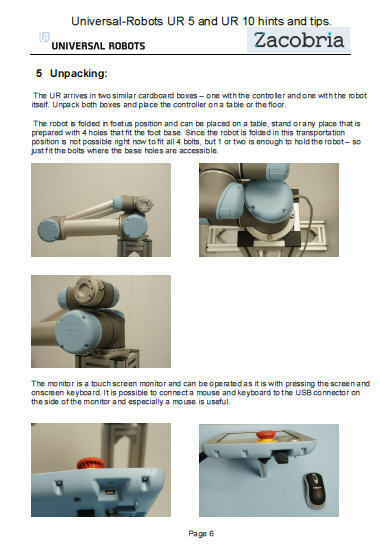 The UR 5 and UR 10 robots from Universal-Robots are programmed from a terminal with a graphical user interface (GUI) which lets you operate the robot, run existing robot programmes, or easily create new ones. 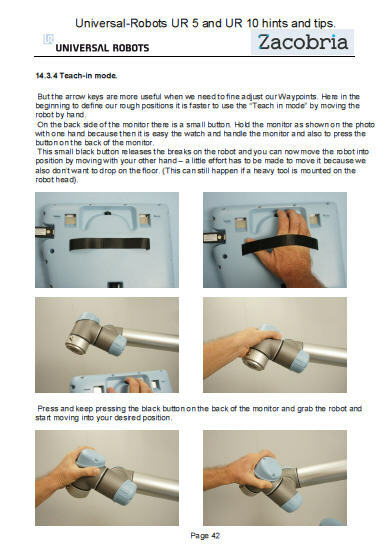 The software is accessed through a touch screen attached to the control box. 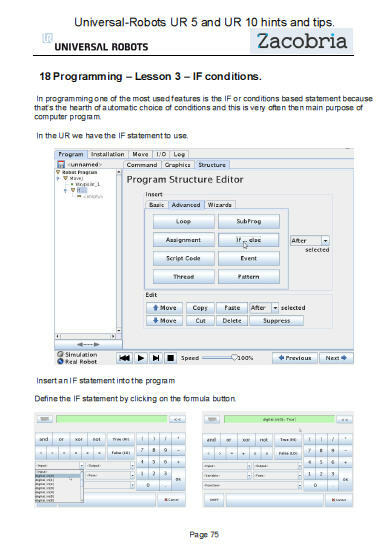 Zacobria has developed comprehensive supplementary manuals with illustration and programme examples. 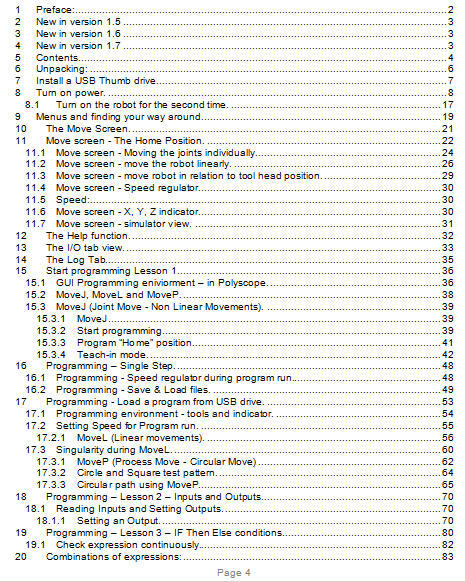 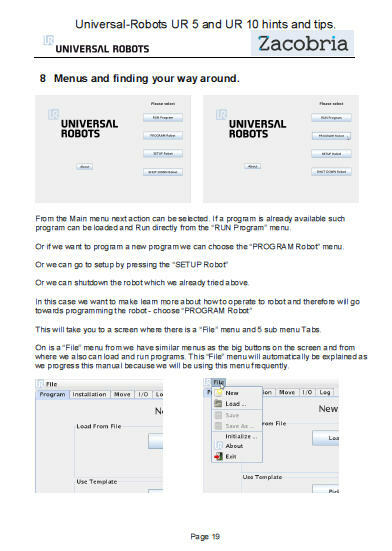 From the link below, the version 1.4 of the Universal_robots_zacobria_hints_and_tips_manual_1_4 can be downloaded. 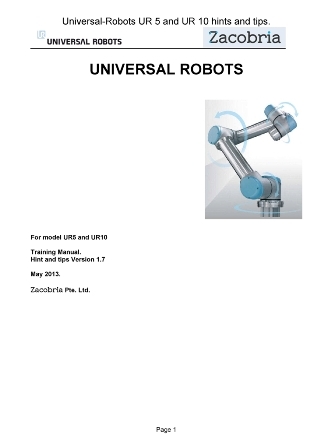 The more recent Universal robots zacobria hints and tips manual version 1.5, 1.6,1.7 or 1.8 is provided with the purchase of a Universal-Robot from Zacobria Pte. 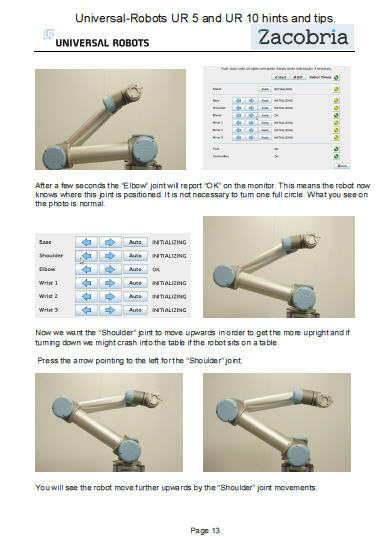 Ltd.
Polyscope robot Software is included, and the controller also has 8 I/O ports on the controller board and 2 I/O at the tool point, all of which can control external equipment such as conveyors or other devices. 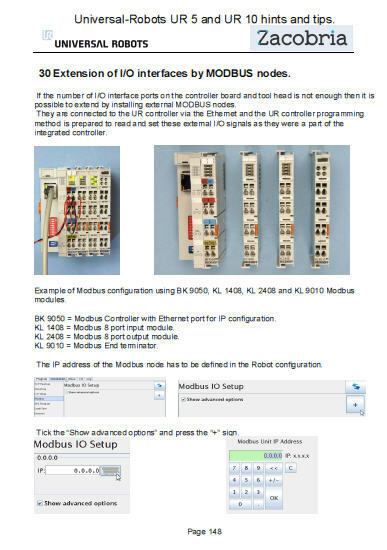 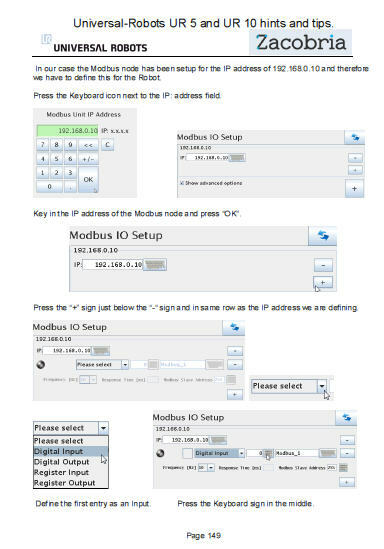 In case of further need for I/O ports, the system is prepared for easy addition of extra I/O ports via Ethernet modules. 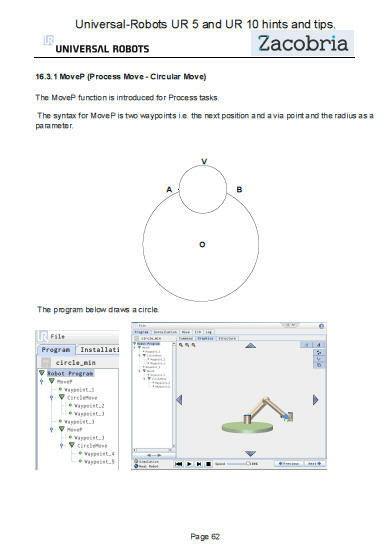 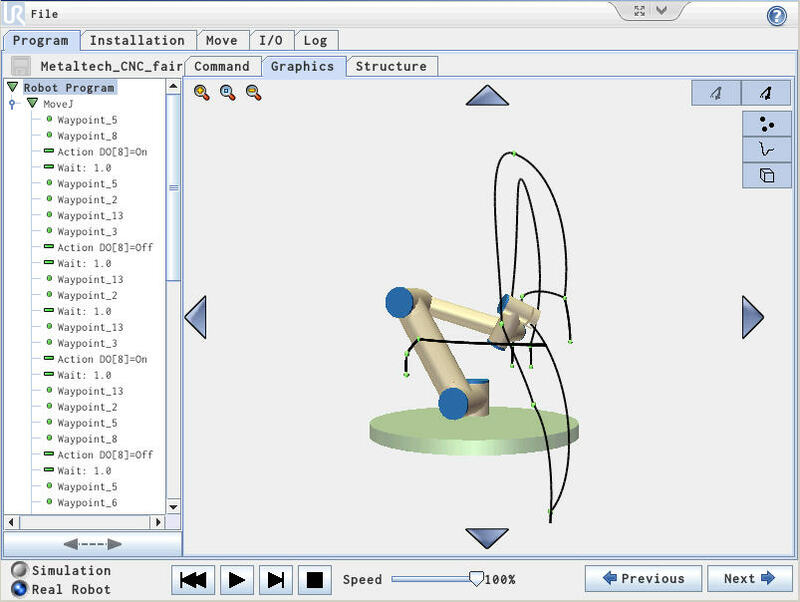 It is quick to set up and program the control software that enables the robot arm to perform a large range of operations by using a simple, graphical user interface. 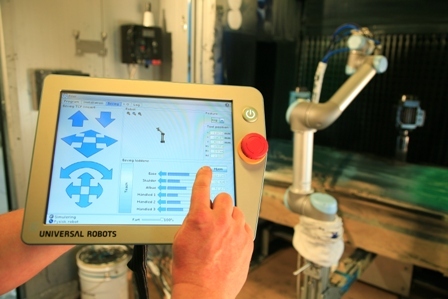 The software runs on the controller delivered with the robot and is operated via a touch screen. 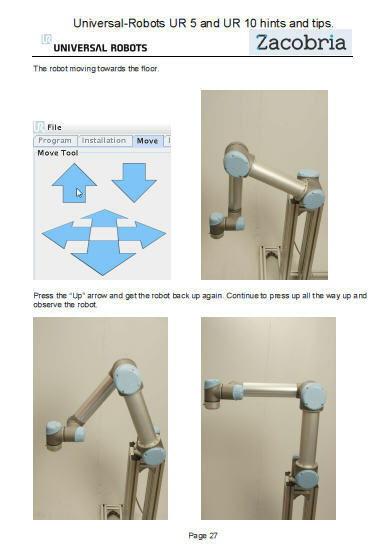 Read more about the Universal-Robots' robot arm. 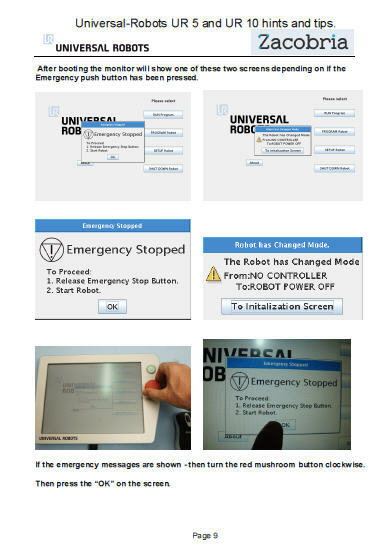 Zacobria Hints and tips manual Version 1.5, 1.6,1.7 or 1.8 is provided with the purchase of a Universal-Robot from Zacobria Pte. 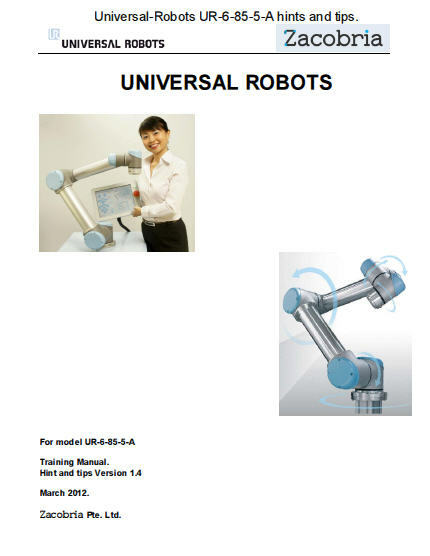 Ltd.
Index of the version 1.7 Universal Robots Zacobria Hints and Tips manual. 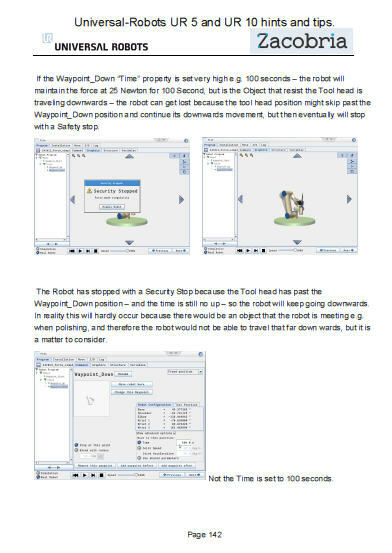 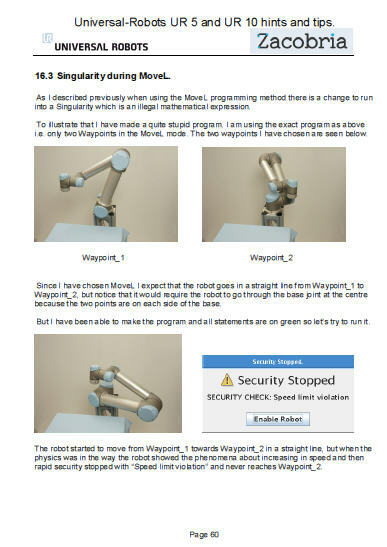 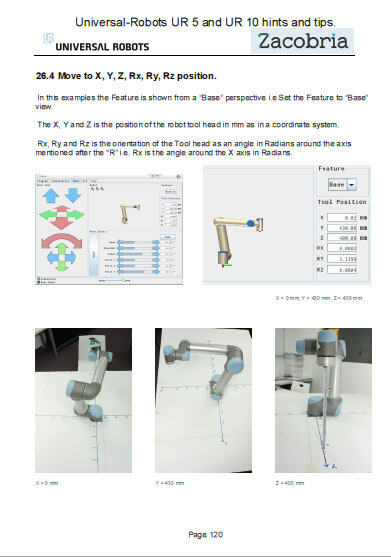 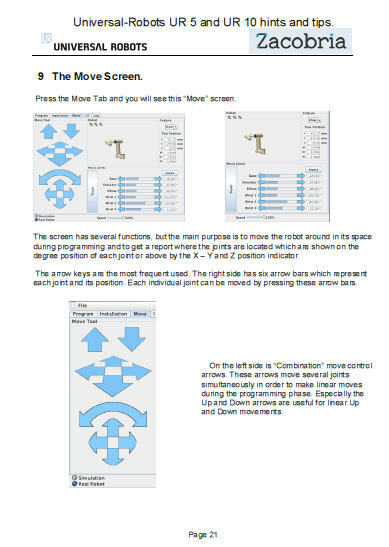 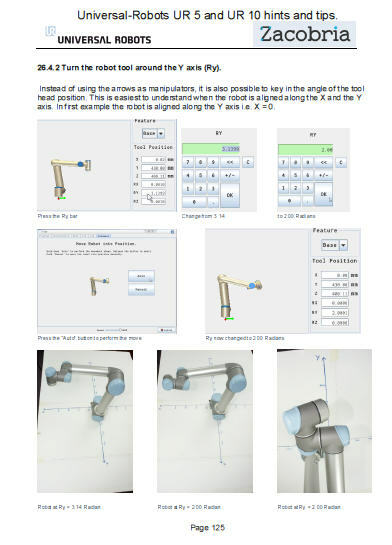 Screenshots from the version 1.6 and 1.7 Universal Robots Zacobria Hints and Tips manual.